The Minerva Piano Trio has been selected for the prestigious St John’s Smith Square Young Artists’ Scheme. 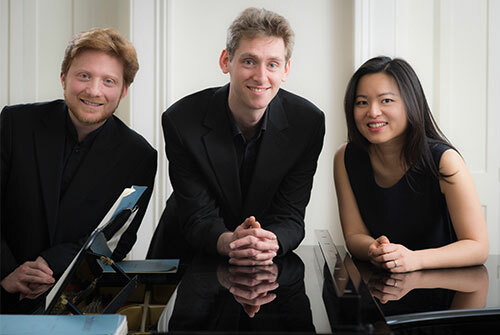 The Minerva Piano Trio was founded by City alumna Annie Yim (Doctor of Musical Arts, 2016) who plays the piano, alongside Michal Cwizewicz who plays the violin and Richard Birchall who plays the cello. The St John's Smith Square Young Artists are each awarded three performance dates in St John's Smith Square over the course of the concert season. They are also given a grant to put towards their own marketing, and are asked to commission a composer to write a new piece of work. The trio went through a tough audition process, submitting video recordings, an artist biography and a reference from a musician of standing. They were shortlisted from over 120 applications and invited to a live audition and interview. Finally six artists were selected. It's a really wonderful feeling, especially after a week of suspense before the result was announced. I am excited to have the opportunity to share an artistic vision with a wide audience through our series of concerts and events. In one of the concerts, the Minerva Piano Trio will be collaborating with a choreographer and composer for a dance project as part of Annie Yim’s performing arts initiative MusicArt London. City has provided a stimulating environment for me to integrate my performance and research activities. The Music Department has supported me in so many ways: my London concerto debut with the City University Symphony Orchestra, the Worshipful Company of Cordwainers scholarship, funding for research conference attendance, and most recently the Doctor of Musical Arts celebration concert. I am truly grateful to my professors and fellow students for all their support. Miguel Mera, Head of the Music Department at City said: "I am delighted that the Minerva Piano Trio have been recognised for their innovative work. St. John's Smith Square is one of the UK's most prestigious concert venues and their Young Artists in Residence scheme is geared towards finding and promoting future stars."